The Young Bucks showed determination and walked away victors in University League game. 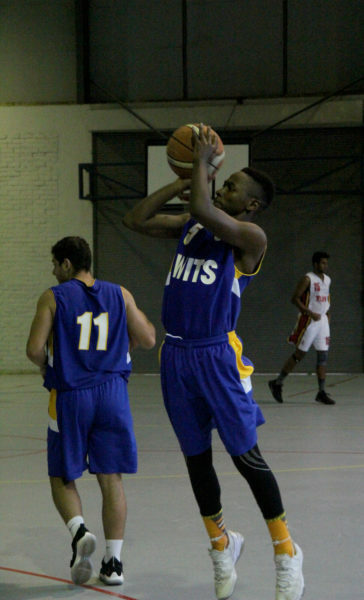 The Wits Young Bucks won against University of Pretoria (Tuks) team in the Men’s Division 2 of the 2018 Gauteng University Basketball League on Sunday, April 15. The game started with high energy and strong play from both teams. Tuks began aggressively but struggled to secure the points which worked to Wits’s advantage. The Young Bucks were quick on their rebounds and kept a strong defence. The first half ended with Wits leading 43 to 21. At the start of the second half, Tuks started to lose energy while Wits kept the pace moving between passes and penalties. Wits capitalised on Tuks’s errors to widen the gap on the scoreboard. In the last quarter, the play became messier and saw more contact between the players as the pressure mounted. Tuks attempted to redeem themselves but could not keep up with Wits’s structured play. In the last minute Wits secured the final points, ending off the game with an incredible score of 97 to 37. Coach of the Young Bucks, Tshiamo Ngakane, told Wits Vuvuzela that this was the best he had ever seen the boys play and that it was their strong defence that secured them the win. “We played a good game. Tuks never had a chance,” he said. The next game in the Gauteng University Basketball League will see the Wits Horny Bucks (senior team) face off against Tshwane University of Technology on Sunday, April 22.